From its lofty seat at the top of the rise, the National Museum looks down like a grand old dame on Prague’s busy Wenceslas Square. Its gold dome and magnificent neo-Renaissance façade dominate the skyline. Although the Museum collection was established in 1818, it did not have a dedicated home until the present National Museum opened on May 18, 1881. Designed by the Czech Technical University’s Professor Josef Schultz, who was also the architect of the Rudolphinum and the National theatre, the National Museum was born of the Czech National Revival movement. 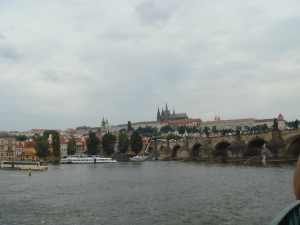 It soon became an important symbol of Czech culture, science and learning. The interior, which was not completed until 1903, is the product of the genius of 19th century Bohemia’s foremost artists and craftsmen. The pillared entrance hall is peopled with sculptor Ludwig Schwanthaler’s statues of Princess Libuse and her ploughman husband Premysl, King Wenceslas and Premysyl Otakar II. Dual staircases, flanked by paintings of Czech Castles and landscapes, lead up to the main gallery. The beautiful glass domed Pantheon displays busts and statues of famous Czech writers, artists and scholars. Its walls are lined with paintings depicting important Czech historical events. The National Museum collection, which is the Czech Republic’s largest and oldest, is fascinating. It traces the evolution of the country and its people. It also includes a vast collection of minerals, fossils and animals, both skeletal and stuffed. Today, the building across the road, which was once the seat of Parliament and then home to Radio Free Europe, is part of the museum complex. State-of- the- art exhibition spaces and 21st century displays have replaced the old vast echoing, halls with their polished wood and glass-fronted cabinets where once I lost myself for hours on a quiet, contemplative journey of discovery. Still, the grand old gold-domed dame, survivor of World War II, when its central staircase was hit by a bomb and of the 1968 Soviet intervention when it was peppered with machine gun fire, will always be the mainstay of the institution, as strong a symbol of Czech culture, science and education as it was over a century ago.